Definition at line 19 of file CMiaseModel.h. Definition at line 32 of file CMiaseModel.h. 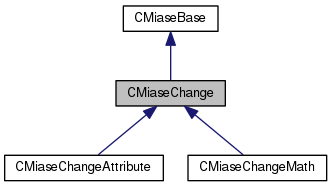 Definition at line 16 of file CMiaseModel.cpp. Definition at line 19 of file CMiaseModel.cpp. Definition at line 22 of file CMiaseModel.cpp. Implemented in CMiaseChangeMath, and CMiaseChangeAttribute. Definition at line 27 of file CMiaseModel.cpp. Definition at line 40 of file CMiaseModel.h. Referenced by getTarget(), and setTarget(). Definition at line 36 of file CMiaseModel.h. 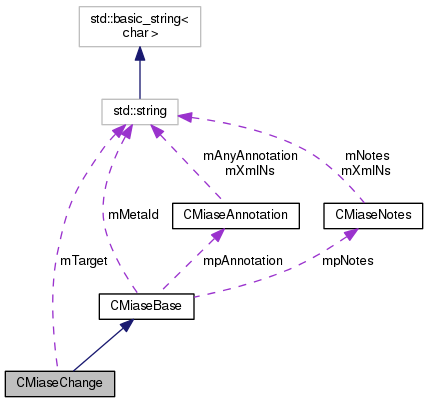 Referenced by CMiaseChangeAttribute::CMiaseChangeAttribute(), CMiaseChangeMath::CMiaseChangeMath(), CMiaseChangeAttribute::getType(), CMiaseChangeMath::getType(), and CMiaseParser::testDataStructure().